Officials from Showalter Roofing Services announced Jason Mayes, Luis Trejo and Jeff Rosier as the company’s new residential sales consultants covering the Chicago and Chicagoland area. The new representatives brings a wealth of roofing knowledge as all three have first hand experience installing roofing systems. Hard to Find Leaks? Look Where It Has Had to Travel. A large junior high school had experienced numerous leaks. Leaks are always a challenge as water can travel a distance before finding a place to enter the building. For this junior high school, the difficulty level was high. Over the years, the school had done its best to maintain a solid roofing system. This time, they needed a new roofing system. 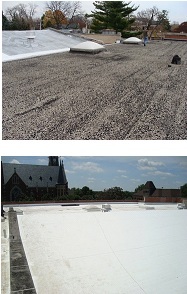 During our evaluation, we found that the school had 2 roofing systems, both were gravel based. This was one of the primary reasons why leaks were hard to find. In addition, the school needed to be in State code using an R20 or R30 insulation. Showalter removed both gravel roofing systems, stripping it down to its deck. We placed proper insulation that met State regulations and sealed it with a TPO roofing system known for its longevity and energy efficiency.